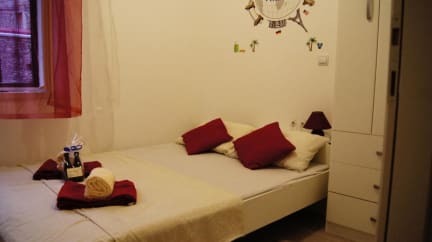 Situated in the heart of old town Šibenik and only 100m from its UNESCO-protected Renaissance St. James Cathedral, Micro Rooms offers affordable private accommodation. Free WiFi and free city maps are available. Our reception is open 24 hours. In the closest area there are many cultural and historical sites as well as many restaurants, shops, cafes. Guests are welcome to explore the medieval town of Šibenik and the nearby Krka and Kornati National Parks. Main city beach is just within a few minutes walk. The main bus station and ferry port are a 10-minute walk away, as well as the train station. Our rooms are newly decorated and feature air-conditioning, reading light and private bathroom with hot showers. Towels and linen are included. We have rooms on the ground, first and 3rd floor. La stanza è piccola (come intuibile dal nome) ma ha tutto quello che serve.